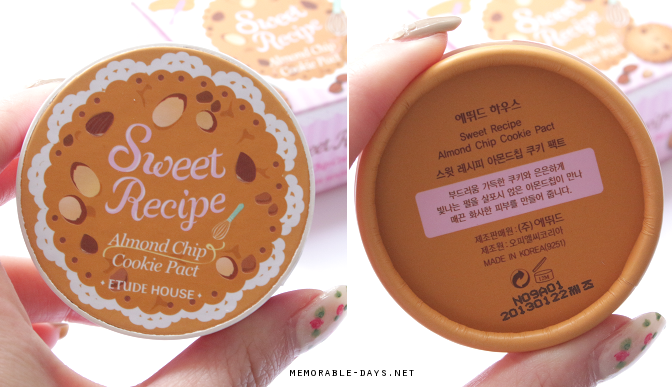 Review: Etude House Sweet Recipe Cookie - Cosmetic-Love | Memorable Days : Beauty Blog - Korean Beauty, European, American Product Reviews. 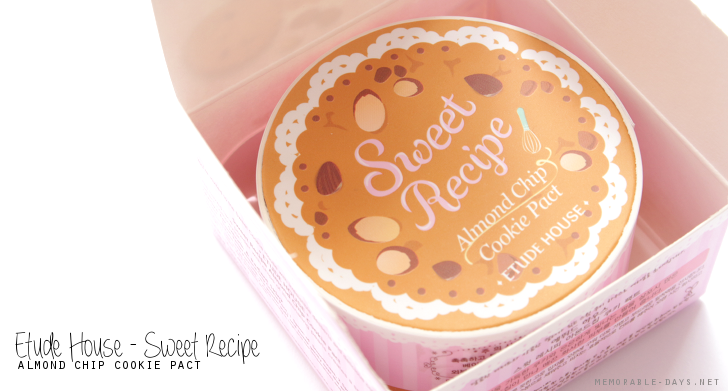 The Sweet Recipe Almond Chip Cookie Pack is a new baked face powder of the Etude House Sweet Recipe collection. There are two shades: Almond chip and Choco chip. Almond chip is the lightest color out of the two which is suitable for people with a very light to medium skin tone. 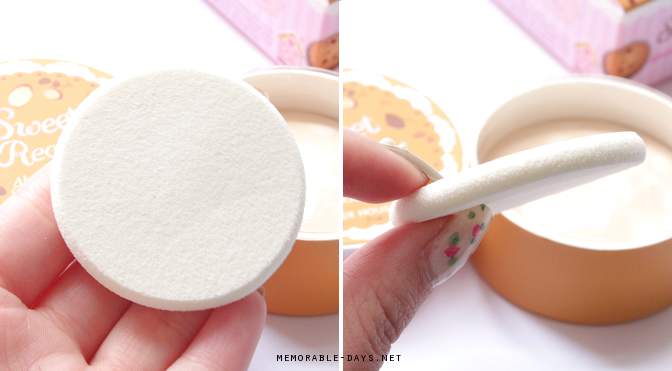 This baked powder can be used as a setting powder and contains illuminating pearls according to Etude House to give a healthy and glowy finish. 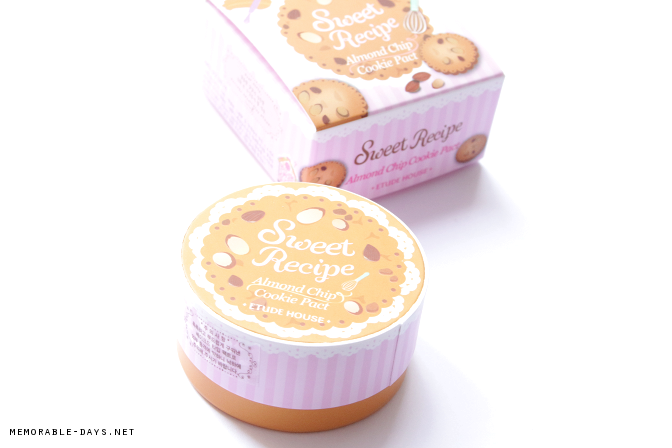 You can purchase this cookie pact at www.cosmetic-love.com (link to the product). They are selling it for $16.90 there including FREE worldwide shipping. They are also selling lots of other Korean make up and skin care products, so make sure to check this store out! As you can see it has an adorable packaging! I haven't really seen such a cute packaging before. The cardboard compact is lovely but I wouldn't recommend to put this in your make up bag. It will probably get smashed/squashed easily. It includes a sponge which feels comfortable on the skin, you might want to wash it before using it. I was very curious about the scent of this product. I had read some reviews about it and people mentioned that it smells like cookies. I have to admit, the cookie pact does have a sweet scent. 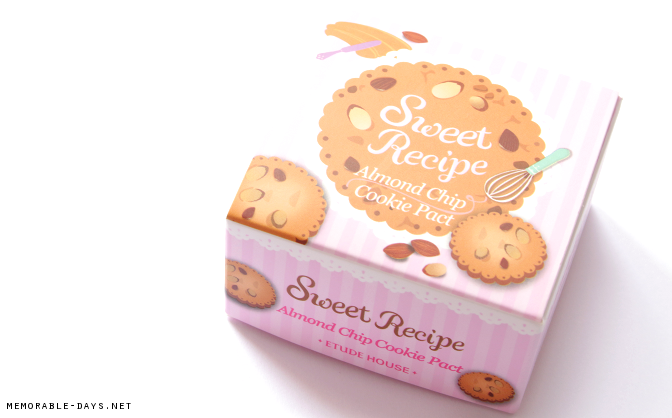 Since this is the almond chip, it has a very sweet almond scent which I like. Also, I'm glad it's not too overwhelming. I am very fascinated and curious how the other products smells like ^o^! It has a light beige shade with white dots (the choco chip is darker!). That's why I took two swatches on my fingers. 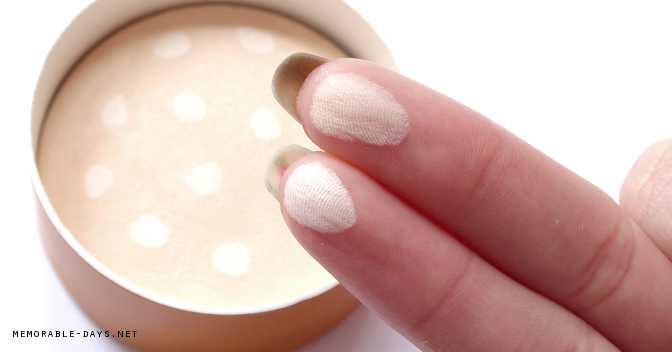 The whiter swatch comes from the dots. 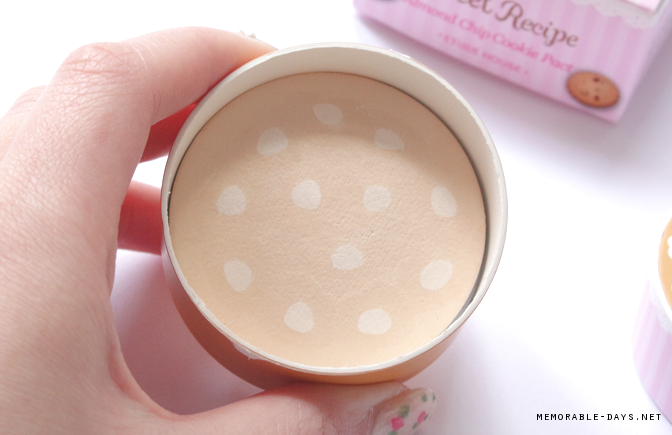 This face powder leaves a pasty finish if you apply it like this (like in the gif below). If you are planning to apply it with that sponge you need to buff it on your face really well in order to avoid looking cakey. I actually prefer to use a powder brush when applying this face powder. It leaves a matte and a bit of a radiant finish (see swatch below), and it makes me oil-free for a few hours. People who has a dry skin, make sure to moist your skin in advance since it will accentuate the dry patches. Overall, this powder is nice. I have to say that it isn't something special, but it does its job and it suits my skin tone. Also, we can't forget about the adorable packaging. It's just super cute and the scent is so fascinating lol. If you are a sucker for cute packaging like me, it is a must have hahaha. If you are interested, you can purchase this product at www.cosmetic-love.com.